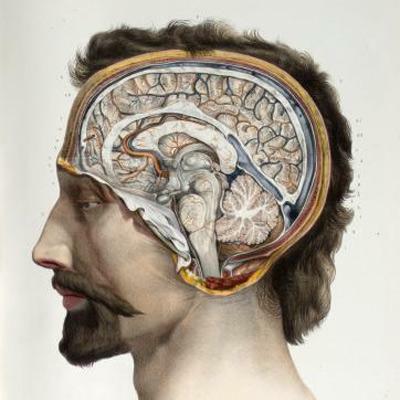 Dissection of the brain, shown in situ, in 5 numbered illustrations. Brain shown with dura mater divided and reflected, hemispheres reflected to show falx cerebri, antero-superior view. Brain divided in transverse section to show cerebral ventricles, antero-superior view. Brain shown divided and reflected to show cranial nerves, cranial fossa, superior views.